There’s a new memoir in town, and author Nancy Mehagian brings authenticity, sensual grit and page-turning adventure to a genre that has lately been called to task. You may recognize her name from ‘On My Radar,’ a frequent column that appears in Sun Community Newspapers. Aptly titled, Mehagian’s ‘Radar’ offers colorful commentary on the world around her, sharing her thoughtful and idiosyncratic observations. 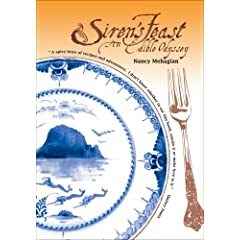 Siren’s Feast — An Edible Odyssey, is a culinary memoir, which makes it extra special. Mehagian takes us through a vivid period (the provocative 60’s and 70’s) of her amazing life and also charts the experience gastronomically, providing fantastic recipes along the way for us to sample in our own kitchens. We not only live through her words but can also create, smell and taste the foods she is describing with over forty recipes. As soon as I opened this gorgeous book at a random page (the elegant cover and layout was designed by Shawn Bayer), a recipe for Stuffed Baked Fish Fillets with Spicy Tomato Sauce (p.51) caught my eye that I immediately wanted to attempt, mainly because just below the title lies the admonition, “This dish will tempt you to overeat.” How well do I know that feeling! This is precisely the kind of meal I want to prepare for my friends and family. In her book, Mehagian opens her heart and soul and shares her deepest and most personal experiences with astounding candor. Here is a gifted author whose vivid, often conspiratorial, prose lightly skips from one exciting escapade to another, keeping you in her pocket as she goes. One minute you are sitting beside her in a fog of hashish as she trips with fellow hippies in Marrakech, the next minute you are swimming naked in the azure waters of idyllic Ibiza (where she opened the party island’s first vegetarian restaurant) or participating in a group meditation at full moon deep in the Arizonan desert. And readers will identify with her intuitive descriptions of the subtle sexual politics that ebb and flow when she encounters attraction in her travels. Siren’s Feast is a marvelous memoir and Mehagian is a talented raconteur who knows how to take her readers on a fascinating journey. If you are willing to be transported to the depths of despair in Holloway Prison, through the menace of Beirut and Kabul and the frenzy of Kathmandu, you will devour the dazzling adventures in this book. Fans of Elizabeth Gilbert’s Eat, Pray, Love will definitely enjoy this edible odyssey as Mehagian expertly navigates the highs and the lows of an eventful life that is brimming with joy and discovery. Bio Continued: With a passionate interest in the diets and customs of those who live close to the earth, Nancy has traveled extensively. In 1975 Mary Burmeister, the only living master of the ancient Japanese healing art of Jin Shin Jyutsu, became her life-long mentor. Since 1978, Nancy has maintained an active Massage Therapy and Jin Shin Jyutsu practice in Los Angeles. She accompanied Quincy Jones on his Jook Joint Tour and was the Massage Therapist for the Eagles’ Hell Freezes Over World Tour. Nancy Mehagian has previously published a vegetarian cookbook for children, Supernatural, lectured at health conventions, catered for celebrities and taught gourmet cooking classes, creating cuisine that is healthy, international and authentic. Nancy lives and cooks in Los Angeles with her dog Cisco. She is currently at work on another culinary memoir, On the Table, chronicling her decades-long career cooking and massaging in Hollywood. Nancy Mehagian has been involved with food and healing since 1969, when she opened the first vegetarian restaurant on the Mediterranean island of Ibiza. A native of Phoenix, Arizona, she attended USC and graduated with a degree in English Literature from Arizona State University. She is also a newspaper columnist and writes the Ask a Healer column for the MadashellClub.net. More below.